These DIN Rail mount cases provide a quick and convenient method to integrate batteries into a DC UPS system resulting in a professional integration. The enclosures feature heavy duty clips for 35mm rail, with additional case top and bottom hanging tabs if extra mounting security or non-DIN Rail mounting is desired. Touch safe screw terminals are located at top of the case for easy connection and wire routing. The convenient fold down door gives quick access to fuses and allows easy battery replacement. 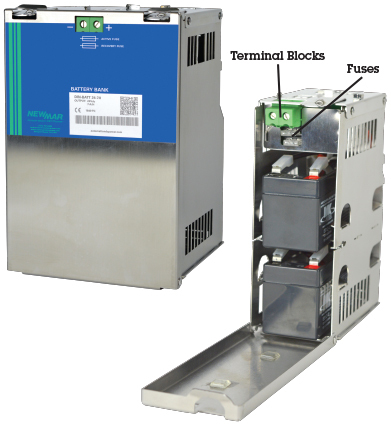 Configuration choices include 12, 24, and 48 volts, in capacity of 1.2 to 14 amp hours. DIN-BAT 12-1.2 12 VDC 1.2 4.6″ x 7″ x 2.75″ 2.55 Lbs. DIN-BAT 24-1.2 24 VDC 1.2 4.6″ x 7″ x 2.75″ 3.8 Lbs. DIN-BAT 12-12.0 12 VDC 12.0 4.9″ x 8″ x 5.5″ 6.8 Lbs. DIN-BAT 24-7.0 24 VDC 7.0 4.9″ x 8″ x 5.5 11 Lbs. DIN-BAT 48-1.2 48 VDC 1.2 2 x Cases (4.6″ x 7″ x 2.75″) 7.2 Lbs. DIN-BAT 48-7.0 48 VDC 7.0 2 x Cases (4.9″ x 8″ x 5.5″) 23.2 Lbs.